Why do so many people subscribe to our Sunday mail? On this page, you hear from the most frequent and most important reasons. These were determined through a survey and single conversations. You will see: there are many occasions for subscribing. These are as varied and individual as our readership. However, one thing applies to all: all subscribed readers have access to more useful and detailed information then non-subscribed readers. And no one ever had to pay a cent for this! Online seminars and their recordings are also almost only available to our subscribers. At external speakers, we bear the costs for you, so that you can entirely concentrate on the content. Some articles that we have produced for smart bank customers are either so personal (because they contain detailed financial information of Gregor or other editorial staff members) or are so detailed that we only want to show them to people, who know us or connected with us through the Sunday mail. Video course / Online manual and further material can be found in the internal area after subscribing, so that you have an easy time to switch from being a normal bank customer to being a smart bank customer or, if you are a new customer at one of the banks thoroughly observed by us, can learn quickly how to cleverly use the account and bank. This can e.g. be the reader´s meeting on the trade fair “Invest” (for which you get a free ticket for all areas), an adventure trip abroad, seminars or a guided tour through one of “our” online banks. You can find current information always in the Sunday mail! Admission to a Community that looks for, finds and uses clever solutions and shares them with others, instead of whining. Much takes place publicly through the comments feature as an additions to our articles. Partially in the internal area or in our a little hidden MasterMind-Group. Specialized book-raffles: in every issue, an e-mail reader wins a copy of the best-seller “Big 5 For Life“ (as a standard the German copy, but on request the English one). Sometimes, further financial books – partially with the signature of the author – are raffled. … or do you want to find out more? Editorial: Why did you subscribe to the Sunday mail? Ingo: In every Sunday mail, there are interesting news for smart bank customers. If one is interested in optimal and favourable banking, then there is no way around. On the website, there is more and more often the note that further information can only be found through the link in the mail. As people are curious out of nature, one wants to subscribe. So did I. Editorial: What advantages did you get out of it? Ingo: I have found out a lot about banks that I did not know before. It has helped me to become a smarter bank customer. Even if I am not interested in all areas, the articles are always thrilling and encourage me to think about it. The Sunday mail has helped me to become a smarter bank customer! Ernst: So that I will always be up-to-date with my account: DKB and so that I am immediately informed of developments on DeutschesKonto.org. Editorial: What advantanges did you get out of it? Ernst: Time-savings in order to not look for current articles. Are you now also on board? You can find more feedback of our readers in the course of this page. From time to time, our editorial manages to find thrilling offers on the market. Increasingly, we also get tips through our readership. The offers are put to the acid test and, if they are really thrilling, then they are prepared, so that you can take a decision fast, whether it is something for you or not. And if yes, then with the according instructions included. Often as a consequence, a great discussion arises in which the exchange of experiences and the mutual helping is the priority, as you can see in the first example. When the Commerzbank determined close before the new year that it still “needed” new customers, it started an offer in which every new customer got a bonus of Euros 200 for opening a free current account. Even better: Commerzbank-customers actually need a monthly money income of Euros 1,200, so that their account really is without account management fee. However, this did not apply to this offer! At least, if one applied for the account online. Apparently, the bank was short in its advertising budget, because one could not find any online or offline ads (as normally ususal). Not even at the big comparison portals, like Check24! Did you miss this Euros 200 bonus? A great offer, of which it was hard to find out and you would have probably missed, if were no subscriber of our mail! Our readers informed us proactively through the Sunday mail. You can read the explanatory blog article here: Euros 200 for new customers! Please scroll below the article and take a look at more than 100 additions via the comments feature by our smart readers. Aren´t they helping each other in a great manner? Become a part of this active community, involve yourselve and profit of the wide scale commitment of other smart bank customers. At the Comdirect Bank, we have managed to organize Amazon-vouchers in the amount of Euros 20 each for the opening of a free current account. This is additionally, because the Comdirect already offers several bonuses in the amount of up to 3 x Euros 50! Therefore, one could get a total of Euros 170. However, if one was a subscriber of our Sunday mail! You can read the accompanying article here. One can hardly predict such offerings. It would not be a serious statement, if I would say, “subscribe today and next week, you receive a voucher of Euros 100”, or the like. This type of bonus indeed exists from time to time, but one does not know when exactly. However, we can promise that we will inform you about it and simultaneously offer according information, so that you can recognize quickly, whether it is worth the trouble for you personally. Still: we are no voucher or bargain hunter portal. Such offers are only accepted, if they fit to us smart bank customers. In the end, we have an extraordinary reputation – and this should remain at all times! Do you want to benefit from this bonus information in the future? Online seminars, also called webinars, have become more and more popular in the past years. Increasingly many people participate in these online events, because it is a very effective way of learning, without having to leave the home. This saves time and costs. Moreover, webinars are offered most often very cheaply or even free of charge. Our webinars are generally free for our subscribers! Monthly webinar for smart bank customers! The plan is to offer one webinar per month about a smart bank customer-subject. Either Gregor personally guides you through it, or an external speaker is hired. We, the editorial, bear the costs for external speakers. As you can imagine, this is an offer with which we also want to acquire new people for our Sunday mail. We are already planning online seminars with speakers that one normally only can experience paying a very high fee! As soon as you subscribe, you have access to all already recorded webinars in the internal area! Actually, we should charge a small fee, as a enthusiastic live-participant wrote us. However, we do not (yet). This will remain the same for all currently with their e-mail address subscribed readers (protection of existing subscribers). Already in the night before publishing the new DKB-conditions, our subscribers received a special note, because the classification into active and non-active customers was so radical! Thanks to our outstanding source from the MasterMind-Group! The recording of the subsequent online seminar, in which the new conditions were discussed and the participants could ask questions, was and is only available to our subscribers! By subscribing with your e-mail address, you receive an access link to our “internal area”. There, you find articles, tables and videos that we do not want to show to random visitors. Not all of our articles are accessible to the general public! Often, because they contain very personal information of Gregor or other editorial staff members. Sometimes, there is more detailed information or a bonus video as an addition to publicly accessible articles. Therefore, for people, who are interested in more! One of many examples from the internal area for you! By the way: our subscribers could vote, whether we should make these “unvarnished” recordings available for you. Do you want to see the video now? Admittedly, this is an evergreen, but also a perennial construction. Evergreen, because a good video course is perfectly suitable to get familiar with a new account quickly and learn the clever use with ease. Perennial construction, because with the development of the account, there is constantly a potential for new chapters. Video courses are only for subscribed readers! Currently, you can benefit from more than 20 DKB-videos and supplementing articles. Do you want to help us with further chapters or with other banks? 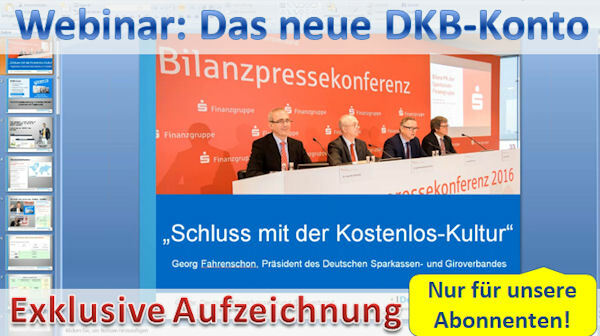 Here an older video from the DKB-video course – but still up-to-date! Do you want to see this and further videos? Gregor visits subject-specific fairs, seminars or speeches since more than 20 years. Since the fact that our frequent readers have grown to several thousand smart bank customers, it is meaningful to organize live events. Either own ones with envisaged visit with guided tour through a direct bank or a reader´s meeting on an event of another organizer. For you with discounted entrance ticket or completely free, as on the specialist trade fair “Invest”! More on that in the Sunday mail and as a review/summary in the internal area. Gregor at a Rich-Dad-seminar in London. One can even play the learning game in Germany. This is only an example for an extraordinary event – especially for smart bank customers. Do you belong to the rather success-oriented people, who want to improve their financial situation? 67 per cent of German people want that too! A fee-free current account with many extra services can be the first step. But how does it go on? Get inspired by our Sunday mail and discuss ideas of it and your own subjects with other participants of our smart bank customer-community. This works best by finding people, who have appropriated such behaviour that you aim at. Look for a new "group" that you can join. This could be a self-help group, a training, an association, an online community or even a magazine that supports your goals. If you surround yourself with people, who feel obliged to the same goals as you do, then your challenge becomes a standard and the change will be easier for you. You join exactly such a community by subscribing to us here … and in the broadest sense, one can regard our Sunday mail as a magazine. However, the most important fact: You stay up-to-date! You will be reminded constantly in a friendly way and are supplied with good ideas. When and whether you use them is completely up to you! Your subscription supports your financial progress! Everyone, who meets Gregor, will hear sooner or later of his “Big Five for Life”. These are the five big things that he wants to do in his life, as well as his life purpose. He has published both here. He was inspired to this by the eponymous best-seller of John Strelecky years ago. That you can read this page and consequently receive further honest financial information via e-mail in the future has developed from the dream through the ideas of this book. Gregor is very thankful for that! … and thanks to you and other readers for opening his e-mails and for reading, discussing and recommending the information. As an appreciation, Gregor gives away a copy of this book to a reader of the e-mail every Sunday. Whether you are the winner next week, you see at the last position in the e-mail. We know that some readers always scroll to the very end first (to see, whether they won) and then scroll up again to read the articles. Stefan: I have subscribed, because there is good and helpful information. As I do not visit the page constantly, I wanted to be informed, whenever there is something new. Stefan: Interesting information, among others, your article about the account system for self-employed persons that drove my attention to the German Skatbank at which I now have my business account. Without subscribing to the newsletter, I would have missed this. And to the internal area, because I like to get the background information. I really liked your “Making off am Flughafen” (making off at the airport). One can see how easy one can record such a thing. If one wants to offer something by oneself. Markus Roth: That I am informed and often directly know, when you write something new. Okay, you could also implement RSS-Feed, perhaps someone can take advantage of it. I also follow many of your YouTube-videos. Editorial: Why are you on board? Armand: Well, the business behaviour of the banking industry nowadays constantly changes and this with increasing speed. But you know that already. However, it is a necessity to stay updated with my knowledge to this changes and adjust my decision optimally. Especially for the reason that the “banking industry” never was my favourite subject to deal with. The Sunday mail provides me with headlines determined by you about the current happenings in the banking industry and helps me to focus and if necessary, guide my decisions. The Sunday mail helps me to improve financially! Do you have questions about the Sunday mail? To the Community? To becoming a smart bank customer? Please use the comments box at the end of this page for that. Many thanks for investing so much time to read until the end about the Sunday mail. Respect! This is a good sign that you are at the right place with us smart bank customers. 🙂 Cheers to a profitable exchange!